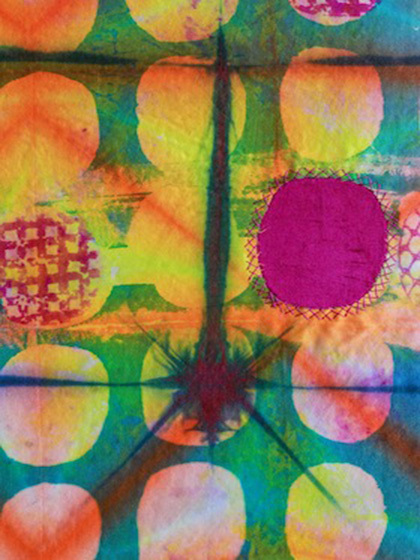 Catherine Kirsch is an emerging mixed media textile artist especially interested in surface design. Surface Design involves altering the color, pattern, and structure of cloth with processes that include screenprinting, thermofax printing, resist dyeing, stamping, and stitching. Her work focuses on the exploration of the grid, using color and texture to create depth and intimacy in her long and narrow panels. She is particularly interested in the study of shibori, the Japanese art of “wringing, squeezing, or pressing” cloth. In 2011, Kirsch completed the Art Mastery Program offered in San Antonio, Texas by Jane Dunnewold, the current President of the Surface Design Association. This almost 3-year program focused on attaining skills using surface design techniques and dyeing processes, as well as understanding color theory, design principles, and composition. Considerable attention was paid to developing a professional presence. Now, she works in her Worcester studio and exhibits locally. When not in her studio, Kirsch is a social worker in private practice in Northborough specializing in couples therapy.